Manchurian is one of the Indo-Chinese fusion craze that exists to date where most us love to relish these snacks. Mushroom Manchurian is one such extremely delicious snack, creativity prepared in a healthy and nutritious way which can be enjoyed guilt free. The mushroom Manchurian looks pleasing to eye and delight to palate mainly for its exquisite flavors and savor. It is a combination of simple ingredients added with exotic spices coated with spicy flour which helps in giving a fantastic crispness and soft and moist inside bursting with explicit taste on bite. They are air fried, hence very low in fat and healthy to eat. 1. Finely cut the stem of mushrooms and keep aside. 2. In a bowl, add in some finely chopped garlic, ginger, soya sauce, vinegar, tomato ketchup, tasting salt and sugar. Mix all the ingredients well. Dip the mushrooms into this mixture and coat them well. 3. In the bowl, add some vinegar, ketchup, green part of spring onions, onion, stem of mushrooms, soaked pressed rice or boiled potatoes, sugar, salt to taste, soya sauce, maida. Mix and make into a dough type of mixture. 4. Stuff this mixture into the mushrooms. 5. In a plate add 1 tsp of oil in bread crumbs and mix well. 6. Beat an egg and keep aside. 7. 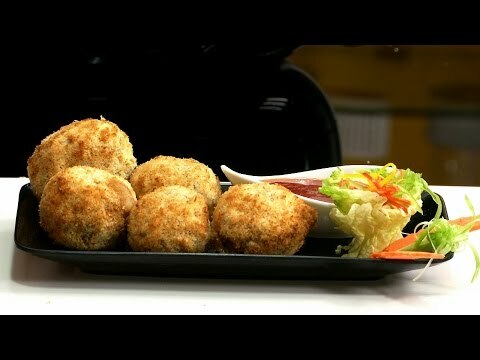 Take a piece of stuffed mushroom, coat it in the flour, dip in the egg mixture and then in crumb mixture and keep aside. 8. Preheat the air fryer at 200 degree C for 5 minutes. 9. Pull out the basket and place the mushrooms inside the fryer. Close and fry the mushroom for about 8 minutes.